When ever the shot clock gets down to 10-12 seconds we want to be organized. We do not want take desperation shots at the end of the shot clock. Basically we want a screen on the ball and a backscreen away from the ball on the weak side. Here the ball is in the middle of the floor. 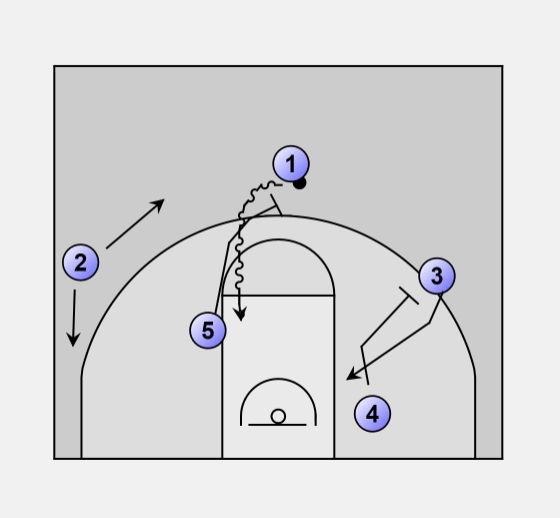 The nearest post player will screen the ball. 1 can drive, hit 5 on the roll, 3 cutting, or kick out to 2. Remember the key is not to panic at the end of a shot clock.